Even if you've already done a Level 3 elsewhere, join us anyway. Then this is the right course for you! This workshop, taught by Lindsay Kenny, Founding EFT Master, is one of the thorough, effective courses in tapping. Read what other grads have said about this extraordinary course. Bundling Baggage, Golden Gate Technique™, Ultimate Truth Statement, Relationship Remedy, Personal Power Process, Role Reversal and other powerful, new Lindsay Kenny processes! Create compelling work materials such as business cards, brochures, intake forms, client files, etc. For those of you not accustomed to the way Pro EFT works, this will be a big help in catching you up with our techniques, processes, tapping points, etc. for the Practitioners class. You need to listen to these recorded teleclasses before the workshop, to get the most out of it . After registering, you will be directed to a confirmation page with the the link to these audios and more. "Lindsay teaches the most in-depth skills in working with psychological reversal and complex issues of any trainer that I've experienced. I cannot recommend her trainings highly enough. Even if you have years of experience like I had, (this class) is invaluable and not to be missed or underestimated. My confidence is at an all time high, and I really feel that there is no issue that I cannot tackle." at checkout...until July midnight July 4th! *24 CEU's or CE's For California practitioners, and other participating states. Please check in your state for reciprocal CEU acceptance. Certificates of Completion are awarded based on successful completion of this course. Venue and Accommodations: We have NOT yet confirmed the venue for this workshop. However, it will likely be at the beautiful Acqua Hotel, on the San Francisco Bay, in peaceful Mill Valley, CA. This elegant hotel is located in the heart of Marin County, next to the San Francisco Bay, and at the foot of Mt. Tamalpais. It's only about 8 minutes from the Golden Gate Bridge. We wil let you know when that is confirmed so you can get the best rate. Meeting these requirements insures you will feel comfortable as we review and use important techniques taught in our Levels 1 and 2, Teleclasses and Webinars. Having these requirements also insures that we are on the same page about using Reversals, our unique tapping methods, the Choice Statements, the Bundling Baggage Technique™, the Golden Gate Technique™, the Ultimate Truth Statement™, the Belief Busting Technique™, muscle testing and more. water in this advanced class. 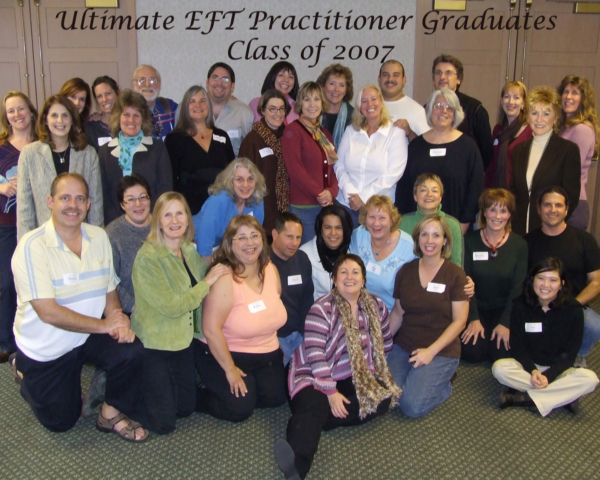 This workshop is about taking EFT and Pro EFT™ and tapping to the highest possible level. Cancellation policy: Once you register you will have access to the Power Package™ downloads and other free material. Therefore there can be no refunds. However, you may apply your tuition toward a future Level 3/Ultimate Practitioners Workshop™ at any time. All of the logistical information you need will be provided once you register. What a fantastic weekend! I've come all the way home (18hrs on the plane) and am still on a high! (and no jet-lag, because I tapped.) I feel inspired and excited and ready to go and conquer! You conduct an AWESOME workshop and your enthusiasm is really infectious. And Zoe is a perfect foil for you - what a partnership! Thank you both for all the stuff you were willing to give to us. I'm over the moon - talk about attracting abundance abundantly! Thanks to you all - what a wonderful camaraderie developed over that weekend. I'll never forget it. Betty Mandzuk, W. Australia. First, great class! I thank you for all your giving of information and the website products. I have already used the brochure template and within a few minutes and a few minor changes I have already started passing out my EFT brochures. Robin G.
Thank you for the Awesome workshop! It was quite a show you and Zoe put on for everyone. Thank you very much for all that you are doing for the group. It's hard to put into words what it means to all of us, and I'm positive that I can speak for all. I'm still reviewing the weekend in my mind and so many wonderful and valuable moments come to mind. I am extremely grateful to you and Zoe for such a gracious sharing of your experience and tools. I look forward to taking EFT to the world now- all of the pieces were answered that were missing before. And I do think "Humor is the best medicine" too and you rule in that department. Judy I.